Welcome to my web site about the ecology and history of the Thousand Islands in Cocoa Beach, Florida. The purpose of this site is to disseminate information about the history and ecology of the Thousand Islands in Cocoa Beach Florida. As materials are created, sections will be added about the lagoon, sea grass, salt marsh, mangroves, the indigenous people (not called the Ais), watersheds, water quality, and some educational ideas for local teachers. Historical material is scattered throughout the site in its applicable areas and definitions are linked to words that might be unfamiliar. This site is best viewed at 1024 by 768 Pixels. 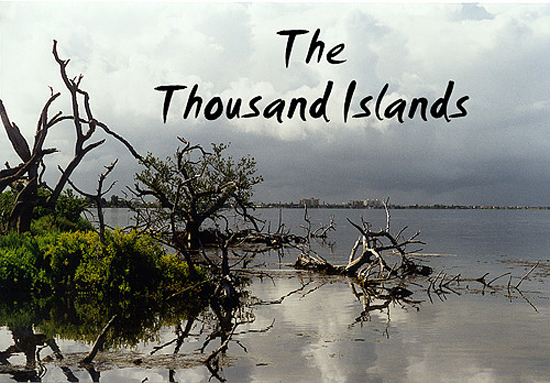 Click Here to start with a brief essay on the origin of the Thousand Islands, or Here for a paper on the Indian River Lagoon. For news be sure to check the News page Here. This website is expensive to maintain so if you’d like to make a small donation, the Paypal button is just below. It would help with costs and be greatly appreciated! One warning about units of measure used in this website - I am aware of the old saying that goes “If we were meant to use the metric system nature would have given us ten fingers” but I dismiss the English system of measurement as clumsy and archaic. The metric system will be used here with English approximations in parentheses. The good news is that for a fairly easy initial investment of time and practice anyone can master metric. The secret is not to think of two and a half centimeters as roughly an inch. Get a metric ruler and go around measuring some stuff and immerse yourself in metric. Your investment will be rewarded in short order. You’ll soon wonder how it is you could ever have thought a system that used clunky units like inches, cups, and ounces was easy. Thanks to L. B. Abrams for help with the zeros and ones that make this site possible.